Looking for a way to have some fun family time, hang out with your friends and neighbors, and sing your hearts out? Come join the Columbia City Family Chorus! Bring the kids, grandparents, cousins…you get the idea! All ages and singing abilities welcome. I’ve been looking for something that my 7yo daughter (Sophia) and I could do together, that we both enjoy. Family Chorus has really SAVED me! I get such joy out of the singing, so much so that even tho I’m dead tired at the end of the day, I drag myself there cause it really fills me up again! And then to have my “shy” daughter say after the first session, “can we go everyday?? ?” She absolutely LOVES it. I feel we’re developing great memories that will last our whole lives. Singing fills the soul, and bonds us together. It’s a really joy to have something that my daughter and I equally love. It us super fun to sing with Kathleen, friends and neighbors. We now sing at home and our son Loren is talking about sharing our new songs at the next family reunion. We absolutely love that we can make no mistakes singing, this makes it so much fun and gives us extra encouragement and inspiration to try and to sing anything. At home we have started to break out in song together for my husband to enjoy since we started singing with you. It is important to have choirs and community chorus’ because of all the cut backs to school singing programs. Singing brings adults and children together in a way that nothing else does. I love being able to do an after school activity together instead of the usual waiting around while Maire or Finn dances, plays soccer etc. And it is so sweet to see some whole families there, singing together. I love that Kathleen gives us fairly challenging songs that stretch the adults. The kids love the harder songs too, and can learn them often more quickly than the adults. We sing a lot of rounds and songs from around the world. At bedtime we often sing a round from choir in parts it’s lovely to end the day that way. Here’s the Family Chorus with the Columbia City Community Chorus singing the traditional Japanese round Hotaru Koi. 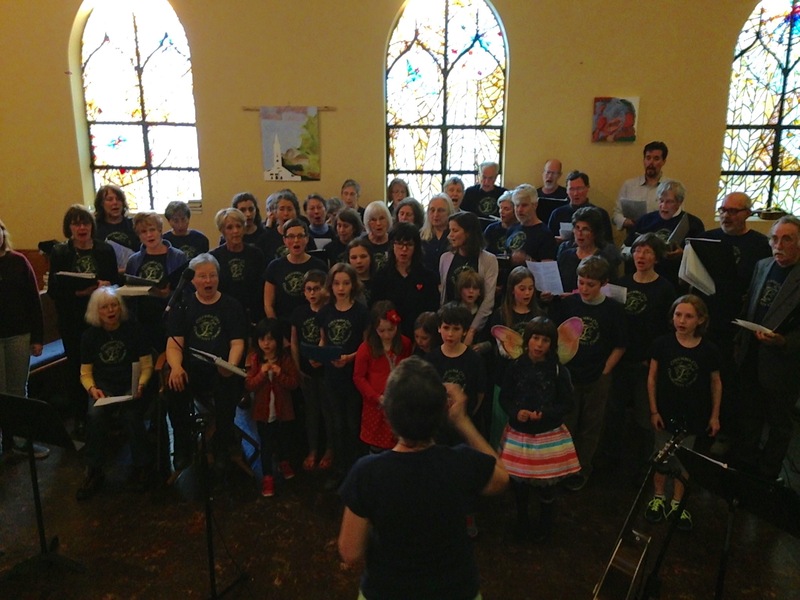 The Columbia City Family Chorus got a nice mention in this recent Parent Map article on how local families define spirituality, in old ways and new. Check it out here!